Susie Qute: Willkommen, bienvenue, welcome, come on in! Thanks for checking out my shiny new blog. I love crafting, thrifting, knitting, decorating, and cooking, and I want to share the fun with you. Let's live the qute life! Today's featured project is something inspired by Pinterest. I've seen many adorable painted bicycles online. When I found one abandoned on the side of the road and missing a pedal, I knew it would find a new home in my side garden. Purchase baskets from the thrift store for a few bucks. Adjust the bike seat and handlebars to your liking (the previous owner had a low rider look). Use dish soap and steel wool to wash the bike and baskets to get rid of the grease and rough up the surface so spray paint adheres better. It took about half an hour to dry and I wiped it with a soft cloth to be sure. If it's wet the paint won't stick. 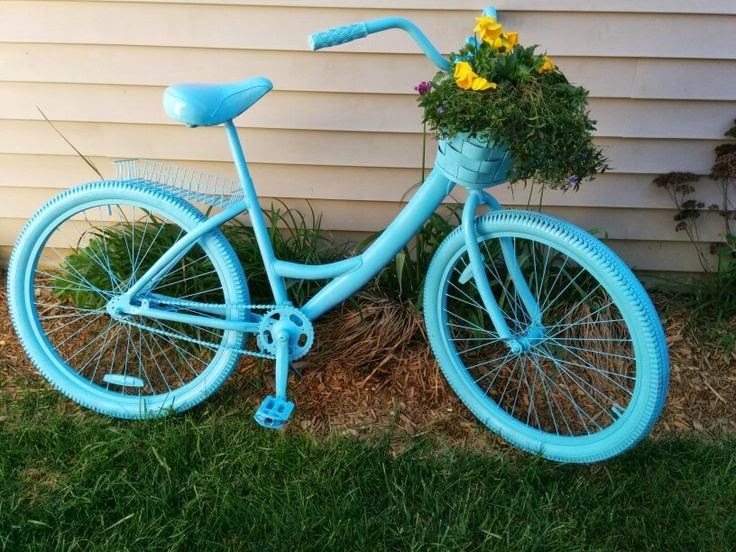 This project used one and a half cans of Rustoleum aqua spray paint to give two coats plus a few touch-ups. It costs about $4 per can including tax. Let it dry between coats and spray lightly to avoid drips. The baskets are attached with aqua ribbon I had on hand. Any ribbon or wire will do, but if yours doesn't match, you should attach them first and then paint the whole thing. Line the front basket with two layers of plastic bags, poke a few holes in the bottom, and add plants from the nursery or transplant from your garden. I plan to add some phlox to the rear basket. Place in your garden, step back and admire, and post a picture of the results! Colorful bikes remind me of living in The Netherlands where so many people use bikes for their main transportation. Most of them were black, but sometimes you'd see a bright bike, like lime with yellow polka dots, parked by a café. They always made me smile, and now I feel a little happy every time I pass my dining room window and see my cheerful aqua cruiser outside.